Events that change the world - be part of the movement! Join us at conferences and events around the world. On 1st and 2nd of July Dr. Petra Kuenkel will attend the conference New Business Models NBM Berlin 2019, where she will join a panel discussion „Rethinking Strategic Management: Can business lead the way to a sustainable future?” on 2nd of July from 17:00 to 18:00. The panel discussion will be hosted by Dr. Thomas Wunder from Neu-Ulm University of Applied Sciences, author of the book Rethinking Strategic Management. Sustainable Strategizing for Positive Impact’ with Dr. Kuenkel’s contribution “What Corporate Strategists Can Learn From International Multi-Stakeholder Collaboration ­- A Conceptual Architecture for Transformative Change”. More on the panel discussion and panelists can be found here: https://www.nbmconference.eu/abc-showcase-panel-academic-business-consulting/. Registration for the conference is possible under the link: https://www.conftool.org/nbm2019/. Dr. Petra Kuenkel explores how activists, change agents, game-changers, and ordinary people can expand their competencies to steward transformations collectively with the conceptual background and application of CLI's core methodological approach, the Collective Leadership Compass. 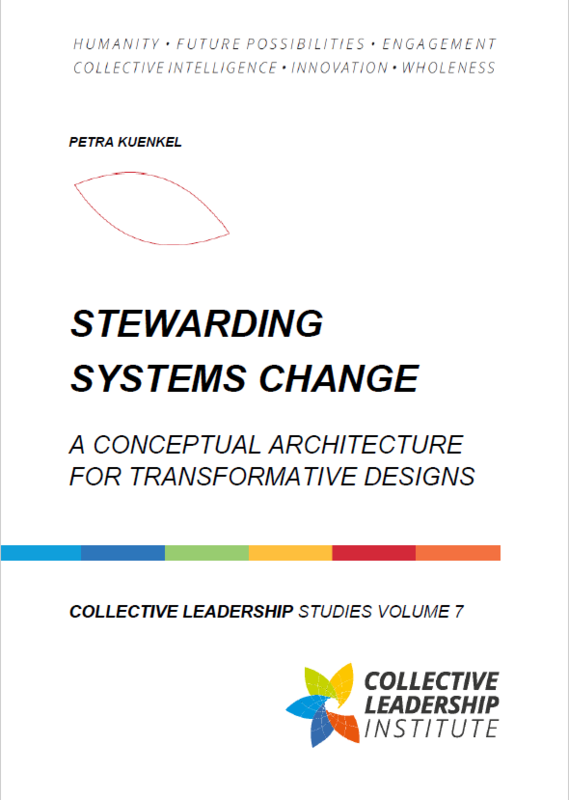 Download the Collective Leadership Studies Volume 7 "Stewarding Systems Change" now. CLI will be present on this conference to foster relationships and dialogue between European and Russian NGOs. More information at http://general-assembly.info/. Our colleague Martin Fielko participates in the conference. The second annual social entrepreneurship network conference in Germany will take place in Berlin, Germany. More information (in German) at https://www.eventbrite.de/e/social-entrepreneurship-raus-aus-der-nische-tickets-58867434080. On 17th May, our colleague Martin Fielko participates in the conference. Find CLI courses in the open course section of the website. On the 6th-8th of February the Leverage Points – International Conference on Sustainability Research and Transformation took place at the Leuphana University in Lüneburg, Germany. On the 6th February from 10:30 a.m. – 12:30 p.m., Dr. Petra Künkel is held the session “Systems Aliveness as a Key Component of Sustainability Transformation” and was part of the of the session “(1.8) Dancing with the system”. On the 8th February from 13:45p.m. – 15:15p.m., the panel (6.9) took place on Sustainability Transformations where Petra Kuenkel had an interesting conversation with Karen O’Brien and Ray Ison. More information on conference’s programme are available here. More information on the Leverage Points Conference and registration can be found here. On the 4th December Dr. Petra Kuenkel visited the University College Dublin to hold a key note speech about the Colleactive Leadership approach in the National Health System reform for England, Scotland, Wales and Northern Ireland with the focus on “Collective Leadership in Healthcare: Development, Implementation and Evaluation Network”. After the keynote speech, during a break out session, Dr. Petra Kuenkel fostered researchers, policy makers, leaders and change agents from various geographic areas across the UK and Ireland, to work toward the common goal of developing collective leadership in healthcare, that will lay the foundation for ongoing measurement and evaluation that will enable the development of an evidence base to support current and future initiatives in this area. The session provided the opportunity to begin to develop an international network for collective leadership research and practice in healthcare. Watch the full keynote speech here. This Seminar have been jointly led by the HRB-funded Co-Lead research team in UCD and the NHS Improvement team working on Culture and Leadership in the NHS. Annual Meeting of the German society CLUB OF ROME e.V. On the 30th November Dr. Petra Kuenkel will spoke about the structures and ways of thinking for sustainability and transformation within the Annual Meeting of the German society Club of Rome e.V. The Annual Meeting gathers people from various sectors who share the concern for the humankind and the planet. The aim of the annual conference is to cultivate the spirit for changing perspectives, processes of reflection and further development. More information on conference’s timeline and registration details are available here. More information on the German society Club of rome e.V. can be found here. This year, the Annual General Assembly of the Club of Rome took place in Rome and was followed by a 2-day 50th Anniversary Conference, open to the public, on the Sustainability Challenges for a World of 10 Billion People. On the 17th – 18th October the Conference brought together an outstanding group of cutting-edge speakers. The aim of the conference has been to increase awareness about the obstacles humanity is facing today, and start focusing on new ideas and initiatives designed to make the world more sustainable. On the 18th October, Dr. Petra Kuenkel, member of the executive committee of the Club of Rome, Head of the Club of Rome working group on Transformations Literacy and founder and exective director of the Collective Leadership Institute discussed together with Hans Herren (President Millenium Institute), Enrico Giovanni (Universitá die Roma Tor Vergata, Spokeperson Italian Alliance for Sustainable Development) and Frans Timmermans (Vice President European Commision) during the keynote conversation “The Sustainable Development Goals (SDGs)-Today’s Implementation Challenges” ( session time 13:30-15:15) how best to think global and act local, how to implement the SDGs, and how to turn challenges into potentials. What Economy is Needed for a World of 10 Billion People? Dr. Petra Kuenkel's Speech on Stewarding Sustainability Transformations at the Annual General Assembly of the Club of Rome. Dr. Petra Kuenkel explores how the 17 SDGs can become a starting point for Transformative Change with the conceptual background and application of CLI's core methodological approach, the Collective Leadership Compass. 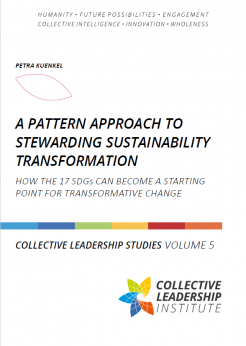 Download the Collective Leadership Studies Volume 5 "A Pattern Approach to Stewarding Sustainability Transformation" now. On the 28th August 2018 the Forum “Thinking the future – preserving the world! 50 years Club of Rome” took place in the Convention Center Castle Herrenhausen in Hannover, Germany. Together with Prof. Dr. Mojib Latif (Head of Research Unit Maritime Meteorology, GEOMAR – Helmholtz Center for Ocean Research Kiel), Prof. Dr. Claudia Kemfert (Head of Energy Department, Transport and Environment, German Institute for Economic Research / Professor of Energy Economics and Sustainability, Hertie School of Governance), Prof. Dr. Ernst Ulrich von Weizsäcker (Co-president, Club of Rome / University of Freiburg), Dr. Petra Kuenkel (Founder and Managing Director of the Collective Leadership Institute) discussed the questions When are the limits of growth exceeded? and the Future of the Club of Rome with its possible future tasks. Further information please find here. From 15th – 31st August 2018 the European Forum Alpbach will take place in Alpbach, Austria. On the 27th August 2018, whithin the European Forum a Political Symposium took place where the Club of Rome facilitated the break out session Nr. 16 “Promoting Sustainable Development” from 10:00 a.m. until 12:30 p.m.
Further information please find here or get in contact with Alina Grün: alina.gruen@collectiveleadership.com. 3rd - 4th July 2018 - Summer Leadership Lab - "Leadership for the future"
On the 3rd – 4th July 2018, the Summer Leadership Lab took place in Denmark in Søhuset Konferencecenter in Hørsholm. Given the enormous changes in global conditions, and accelerated pace of continuing change, what kinds of leadership will be essential for thriving organizations for the future? Dr. Petra Kuenkel is a thought leader on re-inventing leadership as a collective competence and her practical work is grounded in living systems and complexity science. She has a profound background in conceptualizing leadership development in multinational corporations and in dialogic change as an approach to transformation in complex social systems. She created an inspiring keynote speech about her perspective and the perspective of the Collective Leadership Institute on leadership challenges and solutions for the future. Our colleague Stephanie Langsch gave the speech and together with the participants as well as multiple voices from other known speakers they actively actively co-created visions of future leadership. On the 18th – 20th June 2018 the Symposium “Transformative Designs for Sustainability – Facilitating mindshifts for collective action and Anthropocene prosperity” took place in Hannover , Germany. The Transformation Lab is an interactive and co-creative event with a diverse community of scientists and practitioners that connects the inner journey to transformative collective behavior change with deliberate process designs and transformative structural interventions. The Transformation Lab builds on the insight that transformative and systemic change can start at all levels and for all issues. Furthermore, it follows the idea that the human capability to design and steward change is at the core of a responsible Anthropocene. The two main conceptual and methodological approaches the Transformation Lab is based on are The Collective Leadership Compass (CLI – Collective Leadership Institute: www.collectiveleadership.com) and the roceedings of the project: „A Mindset for the Anthropocene“ (IASS – Institute for Advanced Sustainability Studies: http://www.iass-potsdam.de/en/research/mindset-anthropocene-ama). The conceptual thinkers behind the Transformation Lab are Dr. Petra Kuenkel and Dr. Thomas Bruhn. Dr. Petra Kuenkel is a Full Member of The International Club of Rome and the Executive Director and Co-Founder of the Collective Leadership Institute. She is a leading strategic advisor to pioneering international initiatives that address complex sustainability issues in collaboration. Dr. Petra Kuenkel promotes the scaling-up of collaboration skills and transformation literacy for change agents from the private sector, public sector and civil society. With more than 3000 Alumni globally the institute has built transformation competencies for sustainability change agents around the globe. On the basis of more than 20 years experience in complex change, in-depth research into systems transformation and complexity science she has developed the COLLECTIVE LEADERSHIP COMPASS. The methodology has taken many international collaborative initiatives to success. It invigorates the human competencies for collective action and value-based collaboration. More recently she developed the Compass into a conceptual architecture for transformative change designs. Dr. Thomas Bruhn is a physicist working transdisciplinarily at the Institute for Advanced Sustainability Studies (IASS) Potsdam since 2012. Since 2016 he is leading the project AMA (A Mindset for the Anthropocene) on the question how the cultivation of mental qualities like mindfulness and compassion can contribute to sustainability. He is also engaged in research on collective learning and co-creation in the context of political decision-making for sustainability. His earlier work at the IASS focused on the implications of climate engineering and CO2 utilisation. Before joining the IASS he did research in the field of semiconductor nanomaterials and self-organization. Thomas’ key ambition is to bring together a variety of stakeholders in reflexive processes that allow for the emergence of truly shared perspectives and action pathways for a context-specific implementation of specific sustainability targets. He is a member of the thinktank30 (tt30) of the Club of Rome and the German Association of Scientists (VDW). On 18th May 2018, the 2nd Workshop “FairMagnet – Achieving more together: Sustainable mining and processing of rare earths for magnet production” took place in Bonn, Germany. At the second workshop of FairMagnet, representatives of industry, civil society, state and federal authorities as well as research institutions came together to discuss the further development of FairMagnet to an international standard. FairMagnet is a German-Chinese cooperation between raw magnet manufacturers in China and raw magnet importers from Germany to support sustainable supply chains from mining to end use. They performed previously through German Investment Corporation (DEG) and develoPPP and want to transform towards Multi-Stakeholder Partnerships. Dr. Petra Kuenkel gave a workshop session about Multi-Stakheolder Partnerships where she explained how to leverage Multi-Stakeholder Partnerships for systemic change in responsible value chains. This workshop is a contribution towards the implementation of Sustainable Development Goal number 12 “Responsible Consumption and Production – Ensure sustainable consumption and production patterns.” In order to bring change around the SDGs, partnerships are essential to implement the goals. That is why the Collective Leadership Institute sees the Sustainable Development Goal number 17 ” Partnerships for the Goals – Revitalize the global partnership for sustainable development” as key capacitiy. The Club of Rome was celebrating its 50th Birthday. Since its foundation in 1968 the Club of Rome is an important actor in helping humanity understanding its environmental responsibilities and its social liabilities as well as development. Dr. Petra Kuenkel is a full member of the Club of Rome and part of the visionary network that strives to make a difference through scientific research, dialogue and promotion of the impactful results. Together with like-minded colleagues and friends Dr. Petra Kuenkel commemorated this historic event in Switzerland. You can find some photos of the event as well as selected news reporting here. 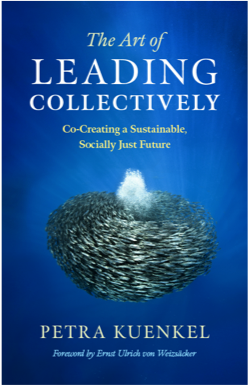 For more information please contact Alina Grün: alina.gruen@collectiveleadership.com. On 29th March 2018 Dr. Petra Kuenkel was invited to give a keynote speech and an expert input at the conference “Sustainable Development Goals: you can not escape it” in Rheden, Netherlands. The conference was focusing on implementation of the SDGs in municipalities. About 150 people with several representatives from different municipalities and VNG International were present to exchange about key success factors for implementation the SDGs and creating positive impact. With the Agenda 2030 “Transforming Our World” we have – for the first time in human history – a global agreement on our joint future. But the ambitious vision will only work, if life improves at the local level. Municipalities can become the key drivers in implementing the SDGs. Leading transformative change collectively in networks and collaboration across sectors or stakeholder groups is paramount. The IASS was officially founded in 2009 as a joint initiative of the German Federal Government, the Federal State of Brandenburg and the research organisations of the German Science Alliance. In its research the IASS aims to merge all relevant types of knowledge – both within and outside science – in order to jointly find solutions that help to initiate, support and scientifically accompany the transformation to sustainable development. The introduction of the term Anthropocene has raised awareness that humans are responsible for the planet as a whole. The question remains if an emerging sense of responsibility will grow quickly enough to induce a change in human behavior. Human-made technology has the power to change the entire planetary socio-ecological system in an unprecedented way. Risk and opportunity move closer together: moving beyond the threshold of planetary boundaries might spark spiraling dynamics. Hence, understanding more about the How of accelerating patterns of transformative change for sustainability has therefore been widely identified as a future research challenge which Dr. Petra Kuenkel discussed in her lecture. For more information please visit the website of the IASS or get in contact with Alina Grün: alina.gruen@collectiveleadership.com. Petra Kuenkel, full member of the Club of Rome, participated at the Annual General Meeting of the Club of Rome with the topic “The Political Crisis in the West”. Find out about Petra Kuenkel’s workshop session: Why is the way we design and implement sustainability transformation so important? Auf der Veranstaltung “Österreichischer CSR-Tag. Better together – Partnerschaften erfolgreich umsetzen!” in Linz, Österreich, wurde der Frage “Wie gestaltet man Partnerschaften erfolgreich, damit Potentiale genutzt und innovative Lösungen hervorgebracht werden können?” nachgegangen. Petra Künkel nahm als Expertin für Kollektive Führung und Kooperationen an dem ExpertInnenpanel Collaborate to Create teil. Des Weiteren hat Petra Künkel eine interaktive und wissensreiche Workshopsession “Komplexität von Partnerschaftsprozessen managen – der Kompass für Kollektive Führung als Orientierung und Planungsunterstützung” gehalten. Für weitere Informationen klicken Sie hier oder wenden Sie sich an Alina Grün: alina.gruen@collectiveleadership.com. Petra Kuenkel gave a speech about challenges of SDG implementation on the 5th of September 2017 from 13:30 to 14:30 pm (CET). The Potsdam Summer School 2017 took place at the Institute for Advanced Sustainability Studies (IASS), the Albert Einstein Campus, and the University of Potsdam. For more information click here or contact Alina Grün: alina.gruen@collectiveleadership.com. Transformations 2017 – In Scotland (the UK) at the University of Dundee, the third in a biennial series of international interdisciplinary conferences took place on transformations towards sustainability, addressing contemporary challenges, and creating conditions for enhancing people’s well-being today and in the future while strengthening the Earth’s support system. Petra Kuenkel presented two practice sessions. For more information, please contact: alina.gruen@collectiveleadership.com. On the 16th of May 2017, the European Club of Rome Members met in Brussels. The topic of this meeting was “Implementing the 2030 agenda when the winds are changing: the SDGs and the interconnected challenges of a changing political landscape in Europe and the US”. Petra Kuenkel, as a full member of the club or Rome, was part of this networking event. For more information, please contact: alina.gruen@collectiveleadership.com. From the 23rd to 24th of February 2017, Petra Künkel, the Collective Leadership Institute’s Co-Founder and Executive Director, participated in a workshop on Measuring Business Impacts on People’s Well-being at the Organisation for Economic Co-operation and Development (OECD) headquarters in Paris. OECD organised the workshop in collaboration with the Society and Organisation Center of the École des Hautes Études Commerciales (HEC Paris), the Humanistic Management Network, and Fordham University. Collaboration is key to SDG implementation – but how to achieve the 17 Sustainable Development Goals? During the Second High-Level Meeting of the Global Partnership for Effective Development Cooperation in Nairobi, Kenya, Petra Kuenkel facilitated a side event on “Raising the bar for effective partnering”. The Promoting Effective Partnering Initiative (PEP), which was introduced at the Meeting, identified 17 effective partnering factors for 17 SDGs. Petra Kuenkel stressed the issue of learning in partnerships. CLIs courses in stakeholder collaboration and collective leadership are tried and tested. Find out about these courses in open or tailor-made formats. CLI was present at this conference in St. Petersburg (Russia) to exchange with NGOs from Russia, Finland and Latvia on SDG implementation. CLI’s contribution had a focus on SDG 17. On the 23rd – 24th Novemebr 2018 Project Manager Alina Gruen will give lectures at the University of applied Science Neubrandenburg , Germany. In the study programme Digitization and Social Structural Change at the University of applied Science Neubrandenburg, Project Manager Alina Gruen will give lectures in the field of Change Management. 11th October 2018 - Participants Conference organized by the Global Compact "Unternehmen 2030: Zielkonflikte lösen - Leitbilder schaffen"
On the 11th October 2018 the participants conference organized by the Global Compact Germany took place in Berlin, Germany. Our colleague Martin Fielko participated in the conference with the topic “Unternehmen 2030: Zielkonflikte lösen – Leitbilder schaffen”/” Company 2030: Resolving conflicting goals – creating mission statements”. On the 5th October 2018 Project Manager Alina Gruen will give lectures at the University of applied Science Neubrandenburg , Germany. From 11. – 13. September 2018 the conference “Zukunft Personal Europe” took place in Cologne. Our colleagues Sabine Heckmann (live virtual) and Martin Fielko (live on site) were at the conference. Working with the WBS Academy, Sabine and Martined explained how we want to step into digitalization and create live online seminars to make our courses even easier and accessible globally. On the 17th – 18th August 2018 Project Manager Alina Gruen gave lectures at the University of applied Science Neubrandenburg , Germany. In the study programme Digitalization and Social Structural Change at the University of applied Science Neubrandenburg, Project Manager Alina Gruen gave lectures in the field of Leadership . Invigorating human interaction systems to drive transformation processes - Take a look at the Transformation Canvas! The Transformation Canvas is inspired by The Collective Leadership Compass developed by Dr. Petra Kuenkel. The Zukunft Personal in Cologne is Europe’s hot spot for HR decision-makers. More than 16,000 HR professionals are expected to come to the fair. The topics covered range from recruiting and human resource services through work-related training courses, leadership and employment law to human resource software and the future of the workplace. CLI’s Martin Fielko was at the Zukunft Personal on 19th September for meetings with HR professionals, as well as training providers. If you are interested in our training programmes for the private sector, feel free to contact: martin.fielko[at]collectiveleadership.com. More information about the Zukunft Personal fair: http://www.zukunft-personal.de/en/visit/. Click the button below to receive the download link for the publication now! Over the years, CLI has developed eight ways to create issue-based collaboration that delivers resilient results and impact with the help of the Collective Leadership Academy, Transformation Support, and Network Building. Please provide your email address to get the direct download link for the publication. Your privacy is protected. Your contact information is secure. CLI will never share, rent or sell your information. We hate spam and we just want you to get this document related to the topics of Collective Leadership, Collaboration, Dialogic Change, and Sustainability. Auf der Veranstaltung Kooperation: Gemeinsam gehen und stärker werden wird der Frage “Was macht eine gelungene Kooperation aus und welche Perspektiven ergeben sich aus dem Zusammenwirken unterschiedlicher Handlungsfelder?” nachgegangen. Sabine Heckmann, Projektmanagerin CLI, hat einen Vortrag über “Kooperationskompetenz -Wie tragfähige Partnerschaften entstehen” gehalten. The Collective Impact Forum, an initiative of FSG and the Aspen Institute Forum for Community Solutions, was the field’s premier annual collective impact convening on May 23-25, 2017, in Boston. The 2017 Collective Impact Convening builds on the success of the 2016 convening in Seattle that attracted more than 450 funders, backbone leaders, and other collective impact community partners. CLI’s experienced colleague Dominic Stucker contributed to this event as a keynote speaker. You want to get more information, please do not hesitate to contact: dominic.stucker@collectiveleadership.com. To deal with the complex and urgent challenges of water security, a new leadership paradigm – collective leadership – is required that recognises the diversity of involved actors as a strength, pools and leverages resources, and improves collaboration across sectors for achieving common goals. Indeed, collective leadership and effective partnerships are essential for the implementation of the Sustainable Development Goals (SDGs) from the local to the global levels. "How to unleash the potential of collaboration? - Leading collectively as a pathway to effectiveness"